Afghan refugees wait for their documents to go back to Afghanistan at the UNHCR's Repatriation Center in Peshawar, Pakistan, June 23, 2016. In the largest influx of refugees returning to Afghanistan since the fall of the Taliban regime in 2001, more than 1 million Afghans have returned home — one-fifth of them involuntarily — from neighboring Pakistan and Iran this year, the International Organization for Migration (IOM) said Wednesday. While more than 390,000 Afghan refugees voluntarily returned under a United Nations repatriation initiative, nearly 620,000 undocumented Afghans came from Pakistan and Iran, and more than 6,000 rejected asylum seekers returned from Europe. Nearly one-fifth of the returnees were deported, mostly by Iran. Afghan refugees and migrants have been returning home all year, but their number swelled in recent months as authorities in Pakistan and Iran stepped up a campaign of harassment and deportation of millions of undocumented Afghan refugees while the U.N. and the government of Afghanistan enticed Afghan exiles with cash grants and offers of land. FILE - Refugees and migrants, mostly from Afghanistan, walk towards the transit center for refugees near the northern Macedonian village of Tabanovce, after being returned from Serbia, Monday, Feb. 22, 2016. As recently as last week, IOM and U.N. data indicated a little over 800,000 Afghan refugees had returned to Afghanistan through early November, but on Wednesday an IOM spokesman in Kabul said that figure has now topped 1 million. 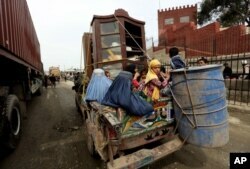 "This is the highest level since 2002," said Matthew Graydon, a spokesman for IOM's Afghanistan office. In 2002, nearly 2 million Afghan refugees, encouraged by the fall of the Taliban in late 2001, returned home from Pakistan and Iran where many had lived for two decades. Nearly 4 million others followed over the course of the next 12 years. As security deteriorated last year, more than 200,000 Afghans fled the country, mostly to head to Europe, marking the largest post-Taliban mass migration out of the country. While many Afghans continue to leave the country, the returnees are coming home at a time when fighting between the Taliban and government forces has internally displaced more than 1 million Afghans this year. With no signs of a letup in the flow of returning refugees, migration advocates are warning about a growing humanitarian crisis. FILE - An Afghan family, returning from Pakistan, watch a short video clip about mines during a mines and explosives awareness program at a United Nations High Commissioner for Refugees (UNHCR) registration centre in Kabul, Sept. 27, 2016. The influx "makes a very large figure for a country which is in a volatile situation when it comes to security and also in terms of economic opportunities for those to be reabsorbed in a very short time," Laurence Hart, IOM's chief of mission in Kabul, said during a visit to Washington last week. After four decades of conflict in their country, Afghans remain one of the largest and most protracted refugee groups in the world, with more than 5 million living in Iran and Pakistan. Of an estimated 2.3 million Afghan refugees living in Pakistan, 1 million are undocumented. Iran hosts an additional 2 million undocumented Afghan refugees and migrants, in addition to about 1 million legal refugees. Of the more than 620,000 undocumented Afghan refugees that returned to Afghanistan this year, most came from Iran. IOM data shows that Iran has deported 174,000 Afghans so far this year, while Pakistan has sent back 22,000. FILE - An Afghan refugee family returns to Afghanistan through Pakistan's border crossing, Torkham, east of Kabul, Afghanistan, March 11, 2015. Pakistan had set a November 15 deadline for the 1 million undocumented Afghan refugees and migrants living in Pakistan to either register or face deportation. Islamabad, however, appears to have allowed the deadline to pass in the face of calls for an extension through the winter from refugee advocacy organizations. Pakistan's Ministry of States and Frontier regions has submitted a proposal to the Cabinet to begin the registration of all undocumented Afghans living in Pakistan, Graydon said. A Pakistani decision not to enforce the deadline will allow refugee organizations "to look at a better and more orderly return over a longer period of time," Hart said. Hart said political and economic factors have contributed to the mass return of Afghan refugees. "Economic uncertainty — which is affecting the whole world — has also brought that decision," he said. 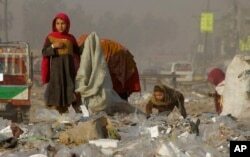 FILE - Afghan refugees girls collect recycle-able goods from a garbage to sell and earn living for their families in Peshawar, Pakistan, Feb. 5, 2016. But another reason is political. Tensions between Pakistan and Afghanistan in the wake of the May killing of the Taliban leader in Pakistan have grown. In addition, Hart said, there are so-called "pull factors" at play. The U.N.'s decision earlier this year to double its cash grant to repatriating refugees to $400 and the Afghan government's offer of land and other assistance have all served to encourage repatriation. With few links to Afghanistan, second- and third-generation refugees returning to Afghanistan have no place to go. While 90 percent of the refugees returning from Pakistan are settling in the eastern province of Nangarhar, many others have moved to Kabul, straining services and contributing to an increase in housing costs. "A lot of people think being in a large urban context might offer them better opportunities than a rural context," Hart said.